This is the page for useful and interesting links related to the IWW in general as well as the Olympia General Membership Branch. The Industrial Workers of the World Main Site– This is the main site for the union in the United States of America. You’ll find current news and useful information. You can also purchase IWW related merch as well as join or pay dues if you aren’t able to meet with any of your local delegates. Organizing.Work – A platform for discussing workplace organizing. Recomposition: Stories about work and resistance – Stories from IWW members about working life, struggles, and resistance. IWW General Defense Committee– Join the IWW General Defense Committee. Stand up to protect the working class. Incarcerated Workers Organizing Committee — the Incarcerated Workers Organizing Committee (IWOC), is a prisoner-led section of the Industrial Workers of the World. They struggle to end prison slavery along with allies and supporters on the outside. Little Big Union — Union of Workers at Little Big Burger; affiliated with the IWW. Burgerville Workers Union — Union of Workers at Burgerville; affiliated with the IWW. Olympia IWW Train Riding SubCommittee – Fellow Worker Gonzo Wobbly’s wonderings. IWW History Project at the University of Washington– This is a good page on basic IWW history hosted by the Labor Archives of Washington and the University of Washington Libraries. Ripples of a Lie– Fellow worker Eugene Barnett was, knowingly, wrongfully convicted of playing an active role in the defense of the IWW hall in Centralia, Washington on November 11, 1919. He spent the rest of his life working to get the truth out about what really happened and the grave injustice that befell him and the other IWW men who defended the hall on that day. His daughter, the peerless, Esther Barnett Goffinet has put out a wonderful booking recounting his story and how the events of that day impacted the families of the brave union men who made a stand for their class in Centralia. This link will get you more info on the book, purchasing options, as well as an audio clip of Eugene Barnett telling his own story. Eugene Barnett Interview– Extended audio of the Eugene Barnett interview mentioned in the previous entry. The Centralia Massacre Collection– Another good resource at the UW. This site links to a collection of primary source material on the Centralia tragedy, including IWW publications, images of posters and other material, as well as various official documents. The Centralia Massacre at the Kirk Library at Centralia College– This collection duplicates some of the material on Centralia 1919 in the UW collection, includes a lot of other material including news stories up to the present, and invaluable oral history interviews with participants conducted by fellow worker Eleanor Walden in the 1980s. The Seattle Civil Rights and Labor History Project– Another wonderful resource from the University of Washington. This one covers a variety of labor and civil rights topics and includes a lot of oral history material from participants in different anti-oppression and labor struggles. No Gods, No Masters– A great anarchist collective doing IWW t-shirts as well as shirts relating to a huge variety of radical and leftist topics. A big chunk of their proceeds go to worthy causes from the EZLN to the Rojava Kurds. PM Press– PM Press was founded at the end of 2007 by a small collection of folks with decades of publishing, media, and organizing experience. PM Press co-conspirators have published and distributed hundreds of books, pamphlets, CDs, and DVDs. Members of PM have founded enduring book fairs, spearheaded victorious tenant organizing campaigns, and worked closely with bookstores, academic conferences, and even rock bands to deliver political and challenging ideas to all walks of life. AK Press– AK Press is a worker-run collective that publishes and distributes radical books, visual and audio media, and other mind-altering material. They offer a huge variety of material. Twin Cities GDC– The website for Twin Cities GDC, an impressive organization that is breaking the ground for a new sort of IWW activism in direct defense of the working class and targeted communities. Whatcom-Skagit IWW– Our sister branch is Bellingham, WA. 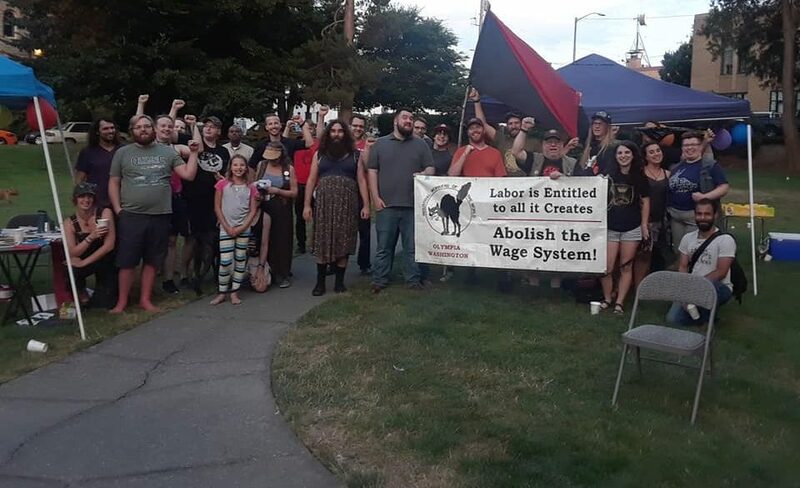 Seattle IWW — Branch in Seattle, WA. Vancouver IWW — Branch in Vancouver, BC.